It’s a common theme that you’ll find repeated over and over in recent research—interview reliability and validity can be greatly improved by adding structure to the interview process. This is terrific news, but it does beg the question—in practical terms, what exactly does it mean to add structure to an interview? Below are eight ways you can add structure to your selection interviews, and in so doing, make it more much likely that you’ll identify the most suitable candidate for the job. Develop job-related interview questions. The extent to which an interview focuses on the knowledge, skills, abilities, and other characteristics (KSAOs) required in the job is probably the single most important factor in determining the success of that interview. Competency profiling—a form of job analysis—provides a clear definition of the KSAOs required for successful job performance. Basing your interview questions on competency profiles (or tasks identified in an alternative form of job analysis), ensures that those questions are job related. Research on interviews dating back to the 1980s demonstrates very clearly that interviews based on job analysis have higher levels of validity than interviews lacking such a basis (e.g., McDaniel et al., 1988). Use the same interviewers. When the same interviewers interview all of the job applicants for a particular job, research has shown that the validity of the interviews improves significantly (Huffcutt & Woehr, 1999). Train interviewers. We’re not born effective interviewers, any more than we’re born with an innate knowledge of Microsoft Office. When interviewers are trained, subsequent interviews are more reliable and valid (Conway et al., 1995; Huffcutt & Woehr, 1999). Establish a standard process of evaluation. Scoring guides are a key method for adding structure to the interview process. Research has found that scoring guides with behavioral benchmarks improve interview reliability and validity (Macan, 2009). Use panel interviews. Interestingly, the research on the validity of panel interviews is more mixed than might be expected. Although panel interviews are often expected to increase rater reliability and validity, some research has shown the opposite (e.g., McDaniel et al., 1994). This area of research is still evolving, and it’s possible that these mixed findings can be traced back to the failure of previous research to distinguish between various key factors, such as the methods used in a reaching decision (e.g., simple averaging versus consensus decision making; Macan, 2009). But if the jury is still out on the relative validity of panel versus individual interviews, panel interviews are the clear winner when it comes to perceived fairness and for this reason they are often favored. Take notes during the interviews. 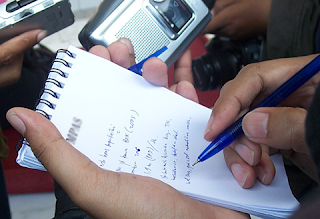 Research has shown that note taking by interviewers significantly improves interview validity (Huffcutt & Woehr, 1999). This evidence dovetails nicely with company policies that require interviewers to take notes in case of subsequent dispute. Limit access to supplementary data. Research has repeatedly shown that giving interviewers access to supplementary material about an applicant—anything from test scores to references—reduces interview validity (Barrick et al., 2008). It seems that despite our best intentions, it’s all too easy to form an impression about a candidate before the interview has even begun. Restricting the amount of supplementary data available to the interviewer is one way to prevent this from happening. Make consistent use of a decision model. Once applicants have been assessed on the KSAOs required in the job, a decision has to be made as to who to hire. Applying an explicit, pre-defined rule when deciding among interviewed applicants improves the validity of the decision-making process (Heneman et al., 2000).